On February 13, 2017, the Maryland Department of Agriculture (MDA) announced that new invasive plants classified as Tier 1 and Tier 2. In 2016, MDA updated the invasive plant species regulations to define what is considered a Tier 1 and Tier 2 invasive plant and when to grow invasive plant species in Maryland. The updated regulations also provided guidance on listing new plant species as either Tier 1 or Tier 2 and the procedure for delisting an invasive plant species from Tier 1 or Tier 2. What Are Tier 1 and Tier 2 Invasive Plants? 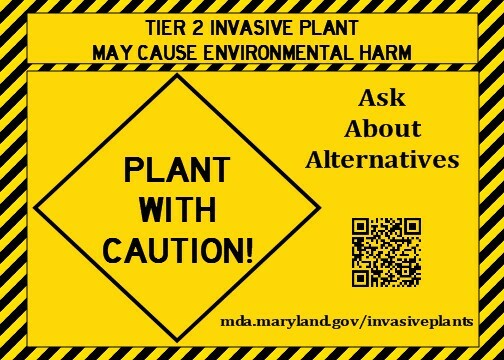 An “invasive plant” is a terrestrial plant species which did not evolve in Maryland and if introduced here would cause or likely cause economic harm, ecological harm, environmental harm, or harm to human health. The decision to consider a plant an invasive plant species is the determination of the Secretary of Agriculture. (§ 15.06.04.02). To sum that up, any plant not native to Maryland and with the potential to harm the State if introduced will be considered an invasive plant species. Iris pseudacorus (yellow flag iris). On February 14, 2018, Euonymus fortune (wintercreeper) and Lonicera maackii (Amur honeysuckle) will be on the Tier 1 list. Wisteriua x yormosa (floribunda x sinensis hybrids). On May 14, 2017, Cytisus scoparius (Scotch broom) and Nandina domestica (heavenly bamboo) will be Tier 2 invasive plant species. Maryland Department of Agriculture does place limits on when you can grow and sell Tier 1 and Tier 2 invasive plant species. With Tier 1, you cannot propagate, import, transfer, sell, purchase, transport, or introduce any Tier 1 invasive plant into Maryland. These restrictions took effect on April 11, 2016, and do not apply when the invasive species is growing on real property about to be transferred, leased, sold, or purchased. For example, if you buy property with fig buttercups growing on it then the restriction would not apply. Another exemption to the limitations on Tier 1 invasive plants would be getting prior approval from the Secretary of Agriculture. To obtain the approval of the Secretary, the person would need to dispose of a Tier 1 plant species, control the Tier 1 invasive plant species, use a Tier 1 invasive plant in research or educational purposes, or export the Tier 1 plant out of the state. For example, if you plan to export yellow flag irises for sale in Virginia, you would need to get the approval of the Secretary of Agriculture before starting to export yellow flag irises. With Tier 2 invasive plants, a person cannot sell or offer for sale at a retail outlet any Tier 2 plant after July 11, 2016. The retail outlet can sell or offer for sale a Tier 2 plant when posting the following sign near the Tier 2 plants http://mda.maryland.gov/plants-pests/Documents/IPACSign_Color.jpg. Landscapers cannot provide to plant or supply Tier 2 plants unless offering a complete list of Tier 2 invasive plants to the customer. Violations of these restrictions can result in a civil penalty not to exceed $500/violation. The Tier 1 and Tier 2 lists may need to be expanded, or plants may need to come off. To request a classification or a declassification, you need to submit a written request to MDA which includes your name, contact information, the scientific name of the plant, and a justification for the request. For example, if you are requesting classifying a plant as Tier 1, you would need to show that the plant is not native to Maryland and would or is likely to cause the harms described above. These regulations just went into effect on April 11, 2016 with the Tier 2 provisions becoming effective July 11, 2016 and many of the Tier 1 provisions becoming effective April 11, 2017. To learn more about the new restrictions and future changes, MDA has a dedicated webpage available at http://mda.maryland.gov/plants-pests/Pages/maryland_invasive_plants_prevention_and_control.aspx.